I love giving gifts from the kitchen…especially this time of year. This is a simple fudge recipe that can be set in cookie cutters and given as a yummy gift. Spray a baking dish and the inside of chosen cookie cutters. Place cookie cutters in the prepared baking dish. Pour mixture through a strainer into bowl with chocolate; let stand 1 minute, then stir until smooth. Pour into cookie cutters and smooth. (Use a little water on your finger for less mess.} Refrigerate until set, atleast 3 hours. 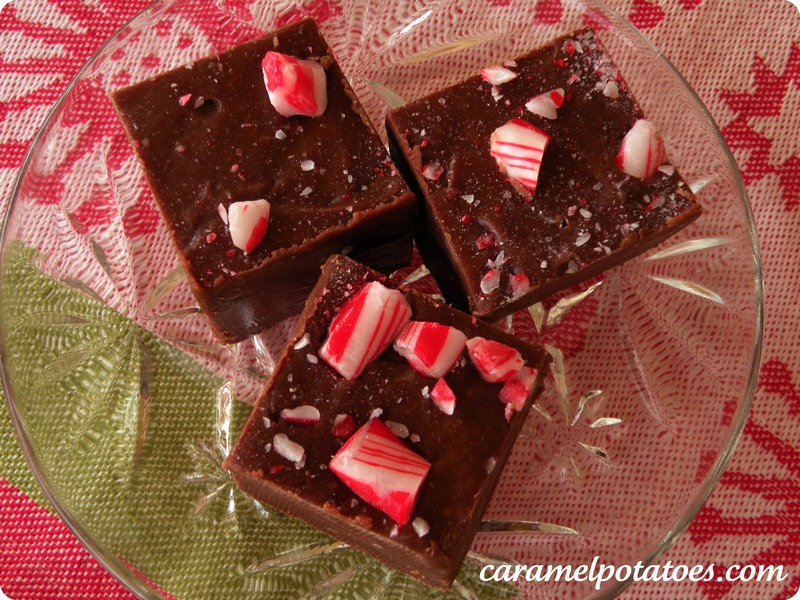 Sprinkle the top of fudge with crushed peppermint candies and gently press into the top. Wrap in a cellophane bag and tie with a ribbon. Now spread the Christmas cheer to all those you love. *Of course you can make this in a 9 inch baking pan.–Lightly coat a 9-inch square baking pan with nonstick spray. Line pan with two pieces parchment paper in both directions, leaving 2 inches of overhang on all sides; spray parchment. Make fudge with the directions above. Pour fudge into baking pan and refrigerate until set, 3 hours. Cut fudge into 1 1/2-inch squares. Sprinkle with crushed peppermint candies.